Heyo, everyone! Bradly here, and today we are bringing to you our first official Sainome Colosseum R blog post. Over the next two-and-a-half months, we are going to be releasing weekly posts about the game. We’ll mostly be focusing on the characters in these posts, but we wanted to start off with one about how to actually play the game. We’ll be posting a tutorial video next month also explaining Sainome’s gameplay, but we wanted folks to have something to chew until then. Thus, here we are. So for the unaware, Sainome Colosseum R is a tabletop combat game for 2-4 players that allows folks to take on chosen character roles, each with an assortment of individual skills and abilities. Using action selection, hand management, card drafting, and dice rolling, the game gives player’s important decision points while blending strategy, luck, and balanced replayability. As you explore the game, you’ll discover the strengths and weaknesses of each character as well as interesting combinations that can put your foes down for the count. Alright, let’s get down to business. We’ll be posting the full rulebook in pdf form the closer we get to the Kickstarter’s launch, but until then, we’ll be talking about the core essentials in this post. We've also included a graphic of the flow of a typical turn. It's important to note that, in addition to attacking through character abilities, players will also use what are called Sainome Cards as tools for attacking their opponents. Sainome Cards are broken down into five categories: items, magic, weapons, non-character-specific skills, and rare armor. These will not be elaborated on in today's post, but folks will be able to read more about them in later posts as well as when we post the rulebook. Starting with the first player, each player takes a turn. The player’s turn is divided into two distinct phases: the Action Phase and the Discard Phase. During the Action Phase, players may choose to perform up to two actions from the options listed below, in whatever order they wish. Players may NOT perform the same action twice during a single turn, and on each player’s first turn of the game, they may NOT Attack an Opponent or Use an Instant Play Card (only options A, B, and E are available during both players’ first turn). Draw Cards: Refill your hand by drawing Sainome Cards from the common deck equal to the amount of cards that will make you meet your hand limit. Attach Equipment: Add any number of Sainome Cards with equipment from your hand to your character. On each side of your Character Card (top, bottom, left, and right) are die icons called equipment symbols that indicate where equipment may be attached. Sainome Cards that can be attached to your character MUST have matching equipment symbols. In addition to attaching new equipment to your character, you may also replace equipment already attached. The previously-attached equipment card is returned to your hand. Use an Instant Play Card: Play one card from your hand with the Instant Play icon and complete the effect written on the card. After being played, the card is placed on top of the discard pile. Attack an Opponent: Declare which opponent you are attacking and then roll the die. A Roll of 1-5: For the attack, you will use the equipment attached to your character in the slot corresponding to the die roll. In the case of multiple matching slots (example: a character with multiple dice icons that have 3 pips), ALL cards are used as part of the attack. All equipment cards used during the attack are discarded after the attack is resolved. If no card is attached in the rolled slot, your attack misses, and the action is spent. A Roll of 6: If a 6 is rolled, you may attack using an equipment card from your hand. After resolving the attack, the used equipment card is discarded. 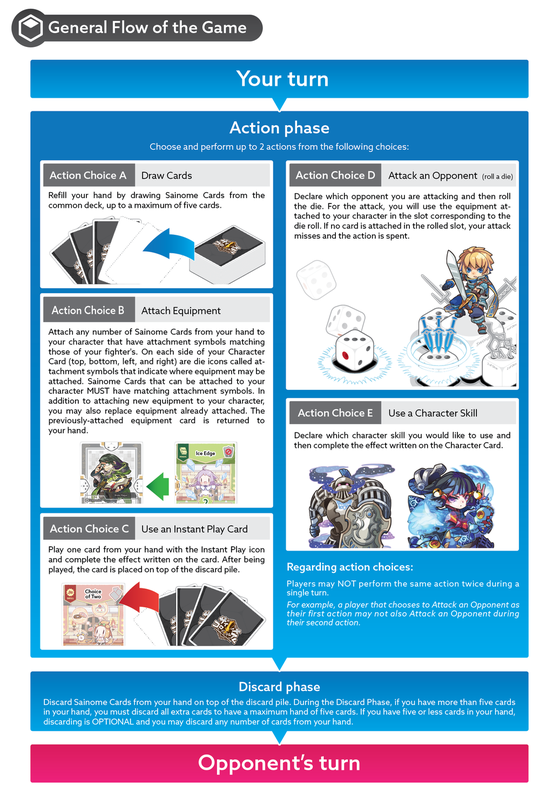 If there are no equipment cards you wish to use for the attack, you may pass, and the action is spent. Use a Character Skill: Declare which character skill you would like to use and then complete the effect written on the Character Card. And that wraps up our first Sainome Colosseum R blog post! Be sure to check back next Thursday when we drop a mega-sized blog chronicling the lore and gameplay of one of the game's characters! We'll be running this series, dubbed "Character Spotlight", every few weeks, leading up to the game's Kickstarter launch. So with that being said, if you have any questions or comments for us, don't hesitate to hit us up on Twitter, Instagram, Facebook, or in the comments section below.